This is a prime site deserving of a landmark building. My first impressions are that it looks like a piece of contemporary (ordinary) commercial architecture (Glass and steel) – nothing special but nothing too ugly – not sure what it will do to the long term overall aesthetic of Civic (better than some there now). The facilities sound very good. As for ‘Melbourne’ lane-ways – we really wish that the press/developers would stop using that cliche; not all Melbourne lane ways work as places to sit outside – especially on cold windy days. Having outside spaces is very good – but the design of the outside spaces, as shown, looks to be very very basic – boring – definitely not good. Yet again – architects do not do outside spaces very well. As to that rooftop solar restriction? What’s that all about? or is it an excuse being offered because they do not want to do it? As I said above “a piece of contemporary (ordinary) commercial architecture (Glass and steel) – nothing special but nothing too ugly”. The the sad thing is that it is ‘contemporary’ – meaning as is found anywhere in the world where these things are popping up. 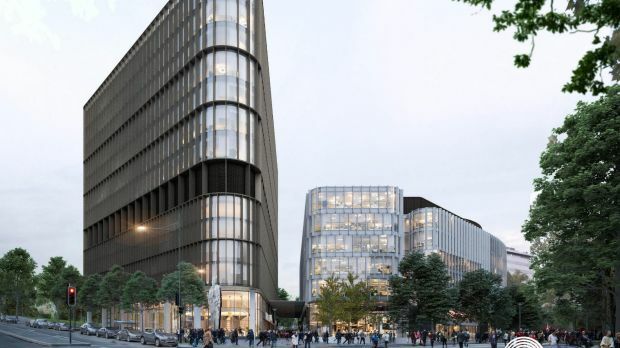 It is sad that someone in government procurement was not insisting on something original – not that pretend ‘star’ architecture stuff (hang decorative metals things off the front etc) – but something that for such an important site should be a landmark building. and the more I look at the sketches for the landscape in between – the more it looks totally boring. If so – a real wasted opportunity. The real disappointment is with the local press – as there is a habit now of taking the press releases on construction and development, such as this one, and simply turning the release into an article – with all the spin as used by the developers. There is no critical thinking attached to most press articles written locally about development. Apparently it is all wonderful – and no other views are encouraged.